Inventory We are a resale marketplace, not a box office or venue. Ticket prices may exceed face value. This site is not owned by Rogers Arena . The Rogers Arena, formerly The GM Place and General Motors Place, is a multi-use arena, located Vancouver, British Columbia a provence of Canada. Opened in 1995, the arena was known as General Motors Place from its opening until July 6, 2010, when Rogers Communications purchased the arena's naming rights from General Motors Canada. 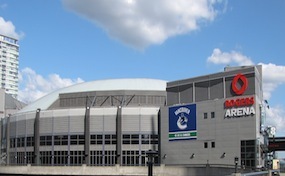 Rogers Arena was built to replace Pacific Coliseum as Vancouver's primary indoor sports facility and in part due to the National Basketball Association's 1995 expansion into Canada. ArenaVancouver.com is not affiliated with any primary box office or supplier. We are a privately owned and operated business specializing in sales in the secondary market. To buy tickets for any Rogers Arena events in Vancouver simply click on the event of interest or call our operators at anytime.